The name is a diminutive of the Italian amaro, meaning "bitter", indicating the distinctive flavour lent by the mandorla amara--the bitter almond or the drupe kernel. However, the bitterness is not unpalatable, and the flavour is enhanced by sweeteners, and sometimes sweet almonds, in the final products. Conflation of amare and amore ("love") is primarily responsible for the associations with romance. 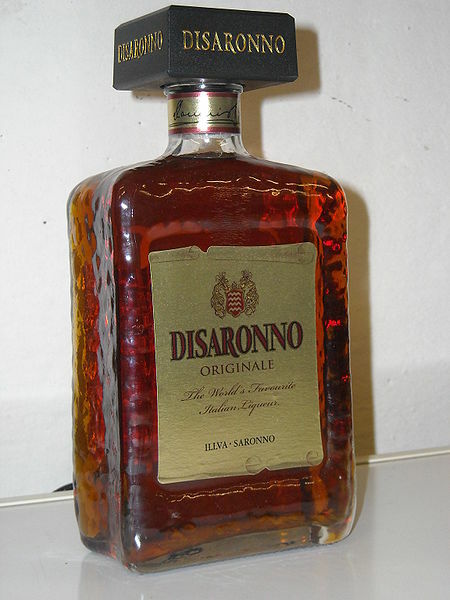 Disaronno Originale (28% abv), the most popular brand of Amaretto, has a characteristic bittersweet almond taste (although it contains no almonds or nuts) and is known for its distinctive appearance. Disaronno claims its "originale" amaretto's "secret formula" is unchanged from the year 1525. Its production remains in Saronno, but the product is sold worldwide. According to the Disaronno website, their Amaretto contains no almonds, and is nut-free. Amaretto may be served neat (by itself) or on the rocks (with ice). It is often added to other beverages to create several popular mixed drinks. It is also a popular choice of liqueur to add to coffee in the morning. One example of a popular cocktail, that highlights Amaretto liqueur as a primary ingredient, is given below.